20/6/14 – Chris had no choice but to take a front wheel off to get 2 studs for the back. It evolved taking the hub apart and prizing off the brake from the hub to get the studs off. Luckily he has the ute full workshop manual to work out how to do that. After many many hours he finally got that sorted. Then he had to get them on the back wheel, things taking longer and a lot harder than it sounds, all day in fact, as Chris encounter a few problems. We didn’t get back on the road until 4.30pm local time, with the idea of getting a few hrs of slow driving in. Chris checked the wheels every 5 km to start, then 10km, then 20km, we had 3 to check now since he had taken studs off other wheels to get us going and we still had dodgy brakes. Well crossing the border into WA was rather an unceremonious event. No signs welcoming you into WA, no bins for quarantine of fruit and veg, just the road got worst. 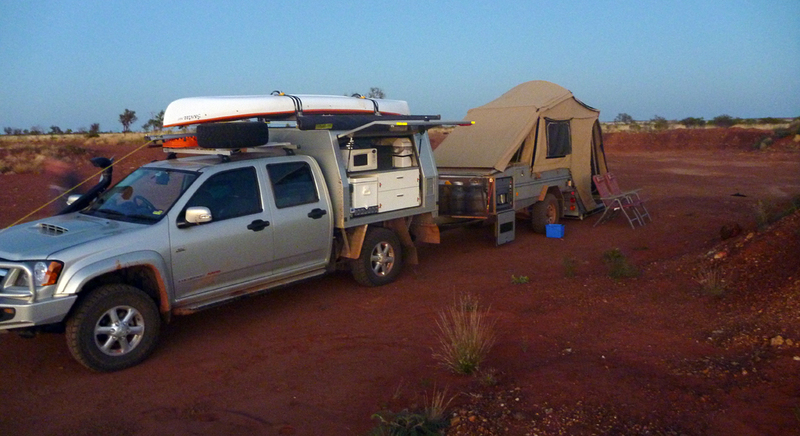 We stopped for the night just after the sun set 250km from Halls Creek in a gravel pit. As it turned out there was one other couple there and they were grateful for the extra campers. Have to be a little careful where you camp this end of the Tanami, we have been told some campers have had local visitors.